Back by popular demand the Bruno Tweedy Pie 45 is loaded with the highly sought after tweed tone of 1959. Using this famous tone as a starting point, Tony has massaged and refined the sound and feel to near perfection. He has also carefully improved the classic tweed cabinet design to maintain the wonderful resonance but thankfully get rid of the highly annoying tweed cabinet buzzes and rattles. This amp has sweet highs, nice warm midrange and full tight bass notes with excellent touch sensitivity and dynamics. At lower volume settings it has thick clean tones, but crank it up and the Tweedy Pie blooms with rich harmonics and superb overdrive. 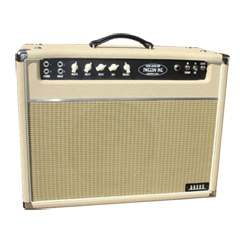 This amp delivers the goods with amazing classic rock tones, phenomenal blues sound and singing sustain. It features 45 watts of dual 5881 power, 2 - 12AX7s, 1 12AY7, and a GZ34 rectifier. The cabinet is constructed of solid pine for its sweet brightness and then fine tuned with a birch ply baffle for superb resonance. Finger-jointed construction is used just like the finest furniture which provides a very strong, extremely rigid, rattle free cabinet that will last a lifetime. Other features include premium tolex coverings, padded handles, heavy duty feet, stainless steel screws/bolts and chromed steel corners. Standard finish is black with an Art Deco style control panel and aged Ivory "chicken head" knobs. Optional custom colors, two tone colors, raw tweed, aged lacquered tweed and select hand finished solid hardwood cabinets by custom order - call or email for the price of these options.